(Isaiah 55:1-3) Ho, every one that thirsteth, come ye to the waters, and he that hath no money; come ye, buy, and eat; yea, come, buy wine and milk without money and without price. Wherefore do ye spend money for [that which is] not bread? and your labour for [that which] satisfieth not? hearken diligently unto me, and eat ye [that which is] good, and let your soul delight itself in fatness. Incline your ear, and come unto me: hear, and your soul shall live; and I will make an everlasting covenant with you, [even] the sure mercies of David. (Revelation 22:17) And the Spirit and the bride say, Come. And let him that heareth say, Come. And let him that is athirst come. And whosoever will, let him take the water of life freely. (John 4:14) But whosoever drinketh of the water that I shall give him shall never thirst; but the water that I shall give him shall be in him a well of water springing up into everlasting life. (John 12:44-48) Jesus cried and said, He that believeth on me, believeth not on me, but on him that sent me. And he that seeth me seeth him that sent me. I am come a light into the world, that whosoever believeth on me should not abide in darkness. And if any man hear my words, and believe not, I judge him not: for I came not to judge the world, but to save the world. He that rejecteth me, and receiveth not my words, hath one that judgeth him: the word that I have spoken, the same shall judge him in the last day. (John 5:33-40) Ye sent unto John, and he bare witness unto the truth. But I receive not testimony from man: but these things I say, that ye might be saved. He was a burning and a shining light: and ye were willing for a season to rejoice in his light. But I have greater witness than [that] of John: for the works which the Father hath given me to finish, the same works that I do, bear witness of me, that the Father hath sent me. And the Father himself, which hath sent me, hath borne witness of me. Ye have neither heard his voice at any time, nor seen his shape. And ye have not his word abiding in you: for whom he hath sent, him ye believe not. 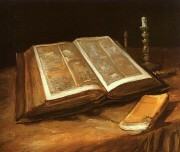 Search the scriptures; for in them ye think ye have eternal life: and they are they which testify of me. And ye will not come to me, that ye might have life.